1 leaf ; 27 cm. "Exterior Quarantines No. 2 (Coffee) and No. 7 (Banana) revised." 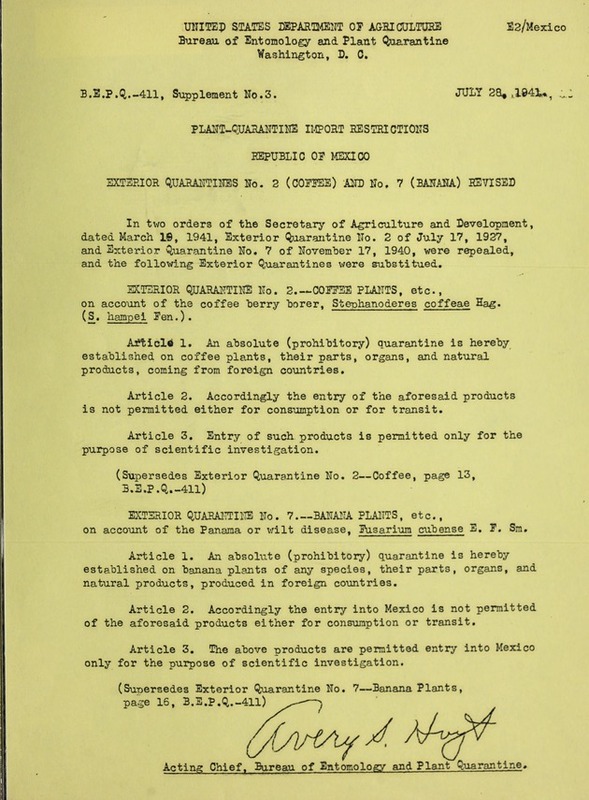 Signed Avery S. Hoyt, Acting Chief, Bureau of Entomology and Plant Quarantine. B.E.P.Q.-411, Supplement No.3. JULY 28 0L194U., :. and the following Exterior Quarantines were substituted. on account of the coffee berry borer, Stephanoderes coffeae Hag. products, coming from foreign countries. is not permitted either for consumption or for transit. on account of the Panama or wilt disease, Fusarium cubense E. F. Sm. natural products, produced in foreign countries. of the aforesaid products either for consumption or transit. only for the purpose of scientific investigation.